The nature of our business implies leaving a carbon footprint originating from our freight and courier activities, but as we care about the environment, we have chosen to erase our negative influence on it. Having taken part in several projects aimed at offsetting our carbon emissions and increasing the efficiency of carbon producing processes with Carbon Footprint, www.carbonfootprint.com, we achieved full 100% Carbon Neutrality status in 2007 and since then we have been doing everything possible to offset our own carbon footprint as an integral part of our business practices. In July 2010 we achieved the PAS2060 accreditation – the first courier company in the world to do so. This was a newly established, robust accreditation and will form one of the requirements in achieving ISO50001, the new energy magnagement accreditation. As part of the requirements of PAS2060, our Appraisal Report and Offsetting Certificate are available for viewing below. Projects aimed at reducing our carbon footprint through energy saving and sourcing alternative power suppliers; We now plant trees in the UK and Kenya. We have installed solar panels on the roof of our Milton Keynes Head Office, further improving our “green credentials”. In line with the fuel-saving projects we have been successfully implementing for years, we have introduced an incentive with a human face – the driver showing the best results in cutting down on fuel usage receives a monthly award as an incentive. We are now embarking upon our ultimate goal: We have started the process of applying for the accreditation of BSI/ISO 50001. Working towards our goals, we have now achieved accreditation under ISO 14001. How can we help you to become greener? 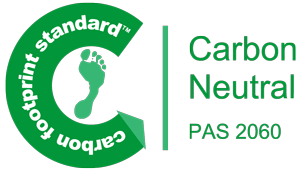 Everything you ship through our company is certified to be Carbon Free. Please, don’t print out this page unless you absolutely need a hard copy! For a copy of our Environmental Policy, please enter your details below.